Adaptación e integridad del cementado de endopostes de fibra de cuarzo con la técnica de inyectado en conductos radiculares amplios. contrario se propone la técnica de inyectado y el empleo de EDTA para medios de fijación resinosos dependientes de sistemas adhesivos, como también el empleo de ácido poliacrílico como acondicionador previo al uso de cemento de ionómero vítreo modificado con resina. Especialista en Odontología Restauradora y Estética (UCS) Docente de Postgrado de Rehabilitación Oral de la Universidad San Juan Bautista y Universidad Científica del Sur; Lima - Perú. Docente Autorizado de la Universidad de Buenos Aires. Asmussen E, Peutzfeldt A, Heitmann T. (1999) Stiffness elastic limit, and strength of newer types of endodontic posts. J Dent; 27: 275–8. Bogra P, Kaswan S. (2003) Etching with EDTA- An in vitro study. J Indian Soc Pedo Prev Dent; 21(2): 79 - 83. Boone KJ, Murchison DF, Schindler WG, Walker WA 3rd. (2000) Post retention: the effect of sequence of post-space preparation, cementation time, and different sealers. J Endod; 27(12): 768-71. Bouillaguet S, Troesch S, Wataha JC, Krejci I, Meyer JM, Pashley DH. (2003) Microtensile bond strength between adhesive cements and root canal dentin. Dent Mater;19(3):199-205. Cheong C, King NM, Pashley DH, et al. (2003) Incompatibility of self-etch adhesives with chemical/dualcured composites: two-step vs one-step systems. Oper Dent; 28: 747–55. De Munck J, Van Meerbeek B, Yoshida Y, Inoue S, Vargas M, Suzuki K, et al. (2003). Four-year water degradation of total-etch adhesives bonded to dentin. J Dent Res 82:136-140. Fauchard P. (1742) The Surgeon Dentist, 2nd ed. Translated by Lindsay L. (1946) London, Butterworth, Vol. 11, pp. 77-80. Ferrari M, Breschi L, Grandini S. (2008) Fiber Post and Endodontically Treated Teeth: A Compendium of Cientific and Clinical Perspectives. MDM, South Africa. Kositbowornchai D, Hanwachirapong D, Somsopon R, Pirmsinthavee S, Sooksuntisakoonchai N. (2006) Ex vivo comparison of digital images with conventional radiographs for detection of simulated voids in root canal filling material. International Endodontic Journal; 39, 287–94. Mazzitelli C, Monticelli F, Toledano M, Ferrari M, Osorio R. (2010) Dentin treatment effects on the bonding performance of self-adhesive resin cements. European Journal of Oral Sciences; 118(1): 80–86. Mitchell CA, Douglas WH. (1977) Comparison of the porosity of handmixed and capsulated glass-ionomer luting cements. Biomaterials; 18(16): 1127-1131. Mitchell CA, Orr JF, Kennedy JG. (1995) Factors influencing the failure of dental glass-ionomer cements due to contraction. Biomaterials; 16: 11-16. Murgueitio R. (2007) Propuesta de una clasificación para medir los defectos de extensión de dientes anteriores con tratamiento de conducto. Revista Estomatología; 15(2):32-36. Nakamichi I, Iwaku M, Fusayama T. (1983) Bovine teeth as possible human teeth substitutes. J Dent Res;62:1076-1081. Pashley DH, Agee KA, Carvalho RM, Lee KW, Tay FR, Callison TE. (2003) Effects of water and water-free polar solvents on the tensile properties of demineralized dentin. Dent Mater; 19: 347- 352. Retief DH, Mandras RS, Russell CM, Denys FR. (1990) Extracted human versus bovine teeth in laboratory studies. Am J Dent;3:253-258. Standlee JP, Caputo AA, Hanson EC. (1976) Endodontic dowels effects of retentive parameters. J Dent Res; Supp1.B 55: 290. Takarada K. (1990) Stable adhesion to dentin. Combination of EDTA 3-2 (NH4/Fe) pretreatment and 2% 4-META/MMA-TBB resin. Shika Zairyo Kikai; 9: 841-849. Tay FR, Loushine RJ, Lambrechts P, Weller RN, Pashley DH. (2005) Geometric factors affecting dentin bonding in root canals: a theoretical modeling approach. J Endod;31(8):584-9. Turner CH, Gross MJ. (1980) An apparatus to record the hydrostatic pressure changes occurring during the cementation of dowel retained prostheses. Eng Med;9:37. Van Meerbeek B, De Munck J, Yoshida Y, Inoue S, Vargas M, Vijay P, Van Landuyt K, Lambrechts P, Vanherle G. (2003) Buonocore memorial lecture. Adhesion to enamel and dentin: current status and future challenges. Oper Dent; 28: 215-35. Watzke R, Blunck U, Frankenberger R, Naumann M. (2008) Interface homogeneity of adhesively luted glass fiber posts. Dent Mater; 1512–151. HIDALGO LOSTAUNAU, Rony Christian; PIGNATA VOLPE, Sergio; MARTUCCI, Daniel Gustavo. Adaptación e integridad del cementado de endopostes de fibra de cuarzo con la técnica de inyectado en conductos radiculares amplios.. Actas Odontológicas (Publicación discontinuada), [S.l. ], v. 9, n. 1, p. 5-16, mar. 2016. ISSN 2393-6304. 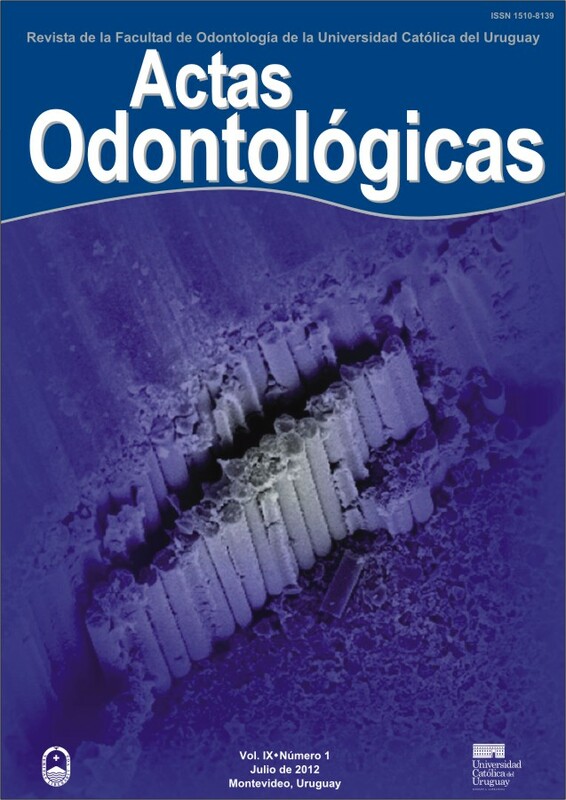 Disponible en: <http://revistas.ucu.edu.uy/index.php/actasodontologicas/article/view/974>. Fecha de acceso: 23 apr. 2019 doi: https://doi.org/10.22235/ao.v9i1.974.